As of the end of July, the U.S. bank prime rate remained at 3.25 percent. 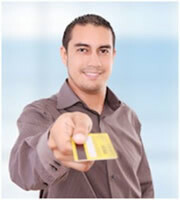 Normally, the prime rate would be a driving force behind changes in credit card interest rates. However, with the prime rate being kept unusually steady (it hasn't changed since the beginning of 2009), changes in credit card rates now put the spotlight on other factors. The most recent set of changes in credit card rates was a mixed bag, with some rates rising and some rates falling. Consumers got the best end of the bargain, with declines in rates for non-rewards and rewards credit cards. Meanwhile, the average rate on student credit cards increased, as did the rate for business rewards credit cards. Only the business non-rewards category saw its average rate unchanged over the second half of July. While the prime rate has remained unchanged, the interest rate environment in general has seen a steady decline in rates. For example, mortgage rates reached new lows during the second half of July, with 30-year mortgage rates dropping below the 3.5 percent mark for the first time since Freddie Mac started keeping track of average rates back in 1971. The drop in consumer credit card rates can be seen as being consistent with this falling interest rate environment. However, the increases in business rewards and student credit card rates seems to go against the grain. Given the falling rate environment, these increases would seem to indicate either some growing concern from credit card companies about the credit risk of these market segments, or profitability issues with those segments. Either way, these rising rates make it more important than ever for businesses and students to shop for the best credit card rates, and use their credit cards wisely. By falling eight basis points to 15.07 percent, consumer non-rewards credit cards returned to the level they were a month ago, after a short-lived increase in the first half of July. Meanwhile consumer rewards credit cards enjoyed an even bigger drop in rates, falling by 12 basis points to 17.64 percent. This put consumer rewards credit card rates at their lowest level since January. These changes in credit card rates had two additional outcomes. One was that the overall consumer credit card category dropped to an average rate of 16.87 percent, its lowest level since mid-March. The other outcome was that the spread between rewards and non-rewards card rates has now dropped to 2.57 percent, the lowest level its been since the end of March. The average rate for student credit cards rose for the third consecutive survey. It is entirely possible that concern over rising levels of student loan debt is leading credit card companies to build a larger premium for credit risk into student credit card rates. With business rewards credit card rates rising to 15.74 percent while business non-rewards credit card rates held steady at 14.74, the spread between rates for these two categories rose to a full percentage point, the highest level it has been all year. While this is not an issue for businesses that routinely pay off their credit card balances every month, it increases the cost of rewards programs for those that do not. The average rate savings for consumers with excellent credit dropped sharply to 3.80 percent, down from 4.02 percent in the first half of July. 0 Responses to "Business and student credit card rates rise while consumer rates drop"